Over the past five years, Earthling Security has been a proud provider of Cloud Computing, Cybersecurity, DevOps and Secure Software Development services to various Federal agencies including the Department of Education, NASA, U.S. Census Bureau, the Department of Defense and GSA. As of July 2017, our ability to service the Federal government has just passed a significant milestone. We're proud to announce that the U.S. General Services Administration (GSA) has awarded Earthling Security a Multiple Award IT Schedule 70 Contract! This long-term IT contract adds Earthling Security to a pre-approved list of technology companies for Federal purchases, making it easier for government agencies to receive high-quality, cost-effective digital services. Our contract number is GS-35F565GA and can be viewed on GSA E-Library. Our Special Item Number (SIN) is 132-51 Information Technology Professional Services and includes labor categories such as Cybersecurity engineers, cloud computing architects, software engineers, DevOps engineers and security analysts. Additionally, we have been approved SIN 132-45D which is for services related to Risk and Vulnerability Assessments. Earthling Security also offers a complete service catalog of managed secure cloud services on Amazon Web Services, Microsoft Azure, VMware and Google Cloud. We offer a unique managed compliance service called FedRAMP-as-a-Service and provide organizations with a 24 x 7 Cloud Security Operations Center (cSOC). If you work within the Federal government and want to learn more about how Earthling Security can provide strategic technical services or are a contractor looking to partner with a firm such as Earthling Security, please don't hesitate to reach out to us. Click here to learn more about how the GSA Schedule 70 works. For more information about Earthling Security’s Federal’s GSA IT Schedule 70 contract services please go to www.gsaelibrary.gsa.gov (GS-35F565GA) or contact us at 202-445-4959. Based out of Tyson’s Corner, Virginia, Earthling Security is an SBA 8(a) certified small business with extensive experience delivering cybersecurity, cloud computing and DevOps technology solutions to both Government and commercial enterprises. We take pride in being recognized in our industry as a leading provider of technology and advisory services to the Federal Government and the private sector. Earthling Security is a strategic, end-to-end Cloud Computing, IT Security and Secure DevOps\AppDev solutions company. Our focus is to provide tailored and strategic business solutions to support and optimize the business mission of our valued clients. View our full Capability Statement here. It's Official: Earthling selected for AWS Public Sector Partnership! Earthling Security, an end-to-end Cloud Computing, IT Security and Secure DevOps solutions company, and an accredited Amazon Web Services (AWS) Consulting Partner has been selected to join the AWS Public Sector Partnership Program. 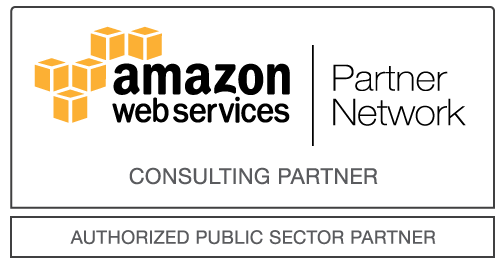 The AWS Public Sector Partner Program recognizes companies with a strong overall AWS practice, and demonstrates their expertise, experience and readiness to support government, education, and/or non-profit customer missions. The program was launched during the AWS annual user conference, re:Invent 2016, held in Las Vegas Nov. 29-Dec. 2. Within the AWS Public Sector Partner Program, approved partners are listed in one or more of the following categories: Government, Primary & K-12 Education, Secondary & Higher Education, and/or Nonprofit. Earthling Security’s FedRAMP-as-a-Service™ is a bundled and automated solution composed of secure cloud products and customized professional services intended for the use of federal government. FedRAMP-as-a-Service™ is a flexible "Full Cloud Stack" service offering that includes automated security, managed compliance, and managed secure cloud hosting in Amazon Web Services (AWS) or Microsoft Azure on the EarthlingCloud platform. Our FedRAMP solutions meet all the requirements for a software application or workload to attain a FedRAMP Authority to Operate (ATO). This includes the required design, strategy, migration, FedRAMP Authorization documentation, penetration testing & 3PAO preparation, and beyond! The EarthlingCloud™ is a managed services platform and 24 x 7 Cloud Security Operations Center (cSOC) designed to host web applications within a secured cloud environment and is bundled with security operations and compliance services. The platform is now available in both Amazon Web Services as well as Microsoft Azure. EarthlingCloud™ supports a “Managed Compliance Meets Managed Secure Hosting” model that is delivered by a combination of the Earthling team’s expertise in compliance and accreditation management with secure cloud design, integration and security operations.